Storage: Avoid direct sunlight and keep it in a cool and dry place. Notice: Covering the can completely after opening and best use within 30 days. Ingredients: Black Sesame, Glucose, Wheat Flour, Sugar, Guar Gum, Yam, Brown Rice, Walnut, Gingko, Lycium Fruit. 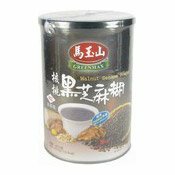 Simply enter your details below and we will send you an e-mail when “Walnut Sesame Powder (馬玉山核桃黑芝麻糊)” is back in stock!